Happy 4th of July! And Welcome to our special tribute to Donald O'Connor and his war time musicals and his co-stars, The Andrews Sisters. 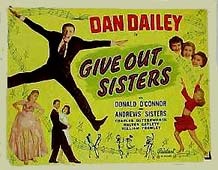 Donald's second career was as a teen star in a series of Universal Musicals that were made during World War II. In fact part of the reason the films were made so quickly was that Donald was going to be drafted when he turned eighteen. 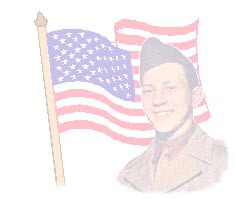 Of course all of the films had the war as a back drop, but some of them were a little more patriotic than others, and below we're going to concentrate on the two that are available on Video, and his co-stars in those, The Andrews Sisters. The three sisters Laverne, Maxene and Patty, were wildly popular during the war and sang hits such as Boogie Woogie Bugle Boy and Don't Sit Under the Apple Tree. They appeared in seventeen films, usually as themselves singing ther songs. Often their roles in the films were the same as in real life... entertaining the troops. In 1954 the group broke up, but reunited two years later. The eldest sister, LaVerne died in 1967 of cancer. Read the inspiring article written by Patty Andrews last year on creating a World War II Veteran memorial. In this film a big band joins the army, which of course results in lots of songs and a loose plot. The Andrews Sisters sing with the band, and then show up in the army camp to sing some more. Donald wasn't in the band, but an underaged kid who lies to join the army. That loose plot we mentioned before had the band's lead singer shirking his duty until the rest of the guys hate him, meanwhile he's romancing an officer's daughter. There are some other luminaries in the cast including Joe E. Brown, stooge Shemp Howard, Mary Wickes and bandleader Harry James. 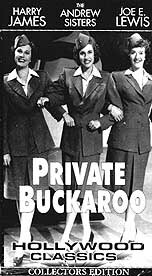 Though you do have to sit through the rendition of the song Private Buckaroo earlier in the picture, there's a musical payoff later as the Jivin' Jack's and Jills with Donald O'Connor, dance the finale, and the Andrews Sisters sing Don't sit under the Apple Tree. This was one of those war time musicals where everyone got into the act. The lead was George Raft, better known for his tough guy roles and not as the dancer he portrays in this film. He's a former vaudevillian who goes to Hollywood and becomes a star. Vera Zorina (also in Donald's movie, On Your Toes), plays Raft's dancing partner and wife. When war breaks out he tries to join the army, but is turned down for health reasons. So he devotes all of his time to putting together shows for the armed forces. The acts included practically everyone on the Universal lot at the time. Donald along with dancing partner, Peggy Ryan have three scenes. One in the Universal crowd when they are first gathered to volunteer. A second where they pick out where they want to entertain, and the third a full scale show (doing the song Kittens with their Mittens Laced) in front of an audience of soldiers. The Andrews Sisters perform a medley of tunes, after a rather bizarre Sophie Tucker appearance. Also featured, Carmen Miranda, W.C. Fields, Orson Welles, Marlene Dietrich, Louis Jordan (doing Is You Is Or Is You Ain't my Baby), Jeanette MacDonald and more. Sprinkled among the numbers are a few dramatic scenes as George Raft and Vera Zorina's marriage starts to fall apart. He works all the time and ignores her and she neglects to tell him she's pregnant. 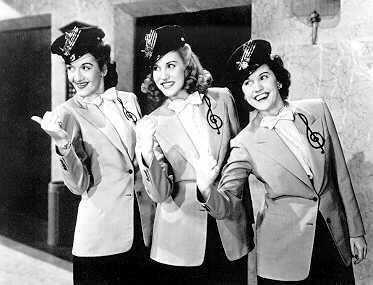 The Andrews Sisters appear again in the final climatic scene, singing Shoo Shoo Baby as the Japanese attack.